Dimethyl sulfoxide (DMSO) is a chemical compound with the formula (CH3)2SO. This colorless liquid is an important polar aprotic solvent that dissolves both polar and nonpolar compounds and is miscible in a wide range of organic solvents as well as water. It has the distinctive property of penetrating the skin very readily, so that one can taste it soon after it comes in contact with the skin. Its taste has been described as oyster or garlic-like. Thick rubber gloves are recommended when handling DMSO. DMSO is a by-product of wood pulping. It was first synthesized in 1866 by the Russian scientist Alexander Saytzeff, who reported his findings in a German chemistry journal in 1867. DMSO is an important polar aprotic solvent. It is less toxic than other members of this class such as dimethylformamide, dimethylacetamide, N-methyl-2-pyrrolidone, HMPA. Because of its excellent solvating power, DMSO is frequently used as a solvent for chemical reactions involving salts, most notably Finkelstein reactions and other nucleophilic substitutions. Because DMSO is only weakly acidic, it tolerates relatively strong bases, and as such has been extensively used in the study of carbanions. A valuable set of non-aqueous pKa values (C-H, O-H, S-H and N-H acidities) for hundreds of organic compounds have been determined in DMSO solution. Because of its high boiling point, DMSO evaporates slowly at normal atmospheric pressures. Reactions conducted in DMSO are often diluted with water to precipitate or phase-separate products. DMSO is an effective paint stripper, being safer than many of the others such as nitromethane and dichloromethane. The relatively high freezing point of DMSO means that at, or just below, room temperature it is a solid, which can limit its utility in some chemical processes (for example, crystallization with cooling). In its deuterated form, that is DMSO-d6, it is a useful but expensive solvent for NMR spectroscopy, again due to its ability to dissolve a wide range of analytes, its own simple spectrum, and its suitability for high-temperature NMR spectroscopic studies. Disadvantages to the use of DMSO-d6 are its high viscosity, which broadens signals, and high boiling point, which interferes with sample recovery from the NMR solvent. Often it is mixed with CDCl3 or CD2Cl2 for lower viscosity and melting points. DMSO is used in the polymerase chain reaction (PCR) to inhibit the formation of secondary structures in the DNA template or DNA primers. It is added to the PCR mix before reacting, where it interferes with the self-complementarity of the DNA, preventing the occurrence of interfering reactions. However, use of DMSO in PCR increases the mutation rate. DMSO is also used as a cryoprotectant, added to cell media in order to prevent the cells from dying as they are being frozen. It may be used at a concentration of approximately 10 percent with a slow-freeze method, and the cells may be frozen at -20°C or stored in liquid nitrogen safely. In cryobiology, DMSO has been used as a cryoprotectant and is still an important constituent of cryoprotectant vitrification mixtures used to preserve organs, tissues, and cell suspensions. Without it, up to 90 percent of frozen cells will become inactive. It is particularly important in the freezing and long-term storage of embryonic stem cells and hematopoietic stem cells, which are often frozen in a mixture of 10 percent DMSO and 90 percent fetal bovine serum. As part of an autologous bone marrow transplant the DMSO is re-infused along with the patient's own hematopoietic stem cells. Use of DMSO in medicine dates from around 1963, when a University of Oregon Medical School team, headed by Stanley Jacob, discovered it could penetrate the skin and other membranes without damaging them and could carry other compounds into a biological system. In a 1978 study at the Cleveland Clinic Foundation in Cleveland, Ohio, researchers concluded that DMSO brought significant relief to the majority of the 213 patients with inflammatory genitourinary disorders that were studied. They recommended DMSO for all inflammatory conditions not caused by infection or tumor in which symptoms were severe or patients failed to respond to conventional therapy. Some people report an onion- or garlic-like taste after touching DMSO. (Onion and garlic also derive their odor from sulfoxides syn-propanethial-S-oxide and allicin.) In the medical field DMSO is predominantly used as a topical analgesic, a vehicle for topical application of pharmaceuticals, as an anti-inflammatory and an antioxidant. It has been examined for the treatment of numerous conditions and ailments. The Food and Drug Administration (FDA) has approved DMSO usage only for the palliative treatment of interstitial cystitis. Medicinal-grade DMSO for this purpose is manufactured by Insource, Inc. under the name RIMSO. Because DMSO increases the rate of absorption of some compounds through organic tissues including skin, it can be used as a drug delivery system. Dimethyl sulfoxide dissolves a variety of organic substances, including carbohydrates, polymers, peptides, as well as many inorganic salts and gases. Loading levels of 50-60 wt. percent are often observed vs. 10-20 wt. percent with typical solvents. For this reason DMSO plays a role in sample management and high-throughput screening operations in drug design. On September 9, 1965, the Wall Street Journal reported the death of an Irish woman after undergoing DMSO treatment for a sprained wrist. Clinical research using DMSO halted and did not begin again until the National Academy of Sciences (NAS) published findings in favor of DMSO in 1972. In 1978, the FDA approved DMSO for treating interstitial cystitis. In 1980, Congress held hearings on claims that the FDA was slow in approving DMSO for other medical uses. In 2007, the FDA granted "fast track" designation on clinical studies of DMSO's use in reducing brain tissue swelling following traumatic brain injury. Glove selection is important when working with DMSO. Thick rubber gloves are recommended. Nitrile gloves, which are very commonly used in chemical laboratories, have been found to dissolve rapidly with exposure to DMSO. Because DMSO easily penetrates the skin, substances dissolved in DMSO may be quickly absorbed. For instance, a solution of sodium cyanide in DMSO can cause cyanide poisoning through skin contact. DMSO by itself has low toxicity. 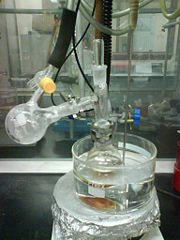 Dimethyl sulfoxide can produce an explosive reaction when exposed to acid chlorides; at a low temperature, this reaction produces the oxidant for Swern oxidation. Recently, it was found that DMSO waste disposal into sewers can cause environmental odor problems in cities: Waste water bacteria transform DMSO under hypoxic (anoxic) conditions into dimethyl sulfide (DMS) that is slightly toxic and has a strong disagreeable odor, similar to rotten cabbage. ↑ Eric W. Smith and Howard I. Maibach, Percutaneous Penetration Enhancers (Boca Raton, FL: CRC Press, ISBN 9780849326059). ↑ Ron Kennedy, DMSO (a.k.a. dimethylsulfoxide), The Doctor's Medical Library. Retrieved November 16, 2008. ↑ R. Chakrabarti and C.E. Schutt, The enhancement of PCR amplification by low molecular-weight sulfones, Gene 274 (1-2): 293–298. Digital object identifier (DOI): 10.1016/S0378-1119(01)00621-7 . ↑ D.E. Pegg, Principles of cryopreservation, Methods Mol Biol. 368 (2007): 39-57. PMID 18080461. ↑ DMSO, Dimethyl Sulfoxide in Treatment of Inflammatory Genitourinary Disorders. Retrieved November 16, 2008. ↑ Diagnose Me, Topical DMSO. Retrieved November 16, 2008. ↑ Drugs, Nuvo announces further update on discussions with the FDA related to review of Pennsaid. Retrieved November 16, 2008. ↑ K.V. Balakin, N.P. Savchuk, and I.V. Tetko, In silico approaches to prediction of aqueous and DMSO solubility of drug-like compounds: Trends, problems and solutions, Current Medicinal Chemistry 13(2): 223. Digital object identifier (DOI): 10.2174/092986706775197917 . ↑ W. Carley, DMSO May Have Caused Death of Woman, Makers of "Wonder" Drug Warn Doctors, Wall Street Journal (1965). ↑ Robert Vignes, Dimethyl Sulfoxide (DMSO): A "new" clean, unique, superior solvent, American Chemical Society Annual Meeting. Retrieved November 16, 2008. ↑ D. Glindemann, J. Novak, and J. Witherspoon, Dimethyl Sulfoxide (DMSO) Waste Residues and Municipal Waste Water Odor by Dimethyl Sulfide (DMS): The North-East WPCP Plant of Philadelphia, Environmental Science and Technology 40 (1): 202–207. Digital object identifier (DOI): S0013-936X(05)01312-X 10.1021/es051312a S0013-936X(05)01312-X . Halstead, Bruce. 1981. DMSO Handbook: A Complete Guide to the History and Use of DMSO. Colton, CA: Golden Quill Publishers. ISBN 9780933904088. Smith, Eric W., and Howard I. Maibach. 1995. Percutaneous Penetration Enhancers. Boca Raton, FL: CRC Press. ISBN 9780849326059. Walker, Morton. 1993. DMSO: Nature's Healer. Garden City Park, NY: Avery Pub. Group. ISBN 0895295482. This page was last modified on 11 December 2008, at 15:45.